Lauren and Daniel's wedding this past Saturday was a success! 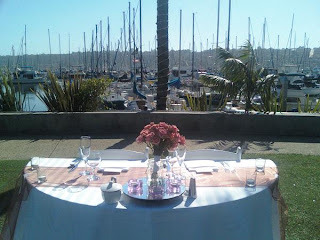 It was a beautiful, warm summer day, and the waterfront venue was perfect. The reception was held at Humphrey's by the Bay on their concert lawn- really incredible. I really like this venue because it is gorgeous and super-convenient. This couple chose to have an afterparty at Humphrey's onsite bar, which is a fun way to extend the festivities. Lauren's choice of pale pink peonies was amazing, and many guests commented on how beautiful her decor was. I have to say, this is one of the sweetest couples that I have ever worked with. They were both really and truly NICE people. I can't wait to get some photos from their photographers to post- they used the brothers from BWright photography, http://www.bwrightphoto.com/. After chatting with them, I was amazed that they do NOT use digital photography at all, but rather film. It gives such an awesome look.